On July 15, 2013 a nationwide strike was called against the verdict of Professor Ghulam Azam's illegal execution. Local Awami terrorists launched an armed attack on protesters in the presence of police in Kushtia's Mirpur thana due to road blockade and picketing in support of the strike in Mirpur thana. 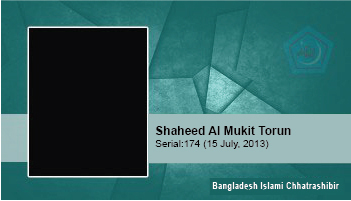 After Al Mukit Torun was injured due to armed attacks by the terrorists in a critical condition, he was taken to hospital, where he attained martyrdom at 7 o’clock.